Sinade, Solihull’s Store Manager, gives us the insider info about her and Jo’s trip to Inhorgenta in Germany – including the launch of Thomas Sabo’s latest collection! As soon as we landed on Friday afternoon we realised that when people had warned us it had been cold, they weren’t lying, it was minus 13 on our first day! We wrapped up warm and headed to the city centre; we plodded through the snow and wondered past frozen fountains in search of inspiration. We were most delighted to find some gorgeous independent jewellery shops – they stocked some familiar brands alongside smaller designers, and they really inspired us with their inviting Spring decorations and got us excited about how we could recreate the same feeling back at fabulous. Saturday morning, we headed to breakfast and then on to the show. This is the third time I’ve visited Inhorgenta and it never fails to impress me; the show is huge, offering halls full of stunning collections from up and coming designers and jewellery makers, to well established brands. We had an afternoon appointment for the big ‘reveal’ from Thomas Sabo, but first we set off systematically around the halls, making sure we didn’t miss anything! We saw loads of stunning collections but our favourite was Danish brand Lund. I don’t want to give too much away just yet – as it will be debuted at our annual Garden Parties in June – but if you love feminine, delicate daisies you won’t be disappointed! Another highlight was the Pandora tree. The tree had been adorned with messages from all the staff at Pandora with their favourite piece of jewellery and their ‘Unforgettable Moment’ it was really impressive and seemed like a lovely idea to hear people’s stories. A big focus for us this year is to introduce some more watch brands that fit the fabulous ethos, like Bering which arrived in-store and online just before Christmas. The Bering stand was buzzing and it was clear to see that Bering is becoming a must have collection! We were also there to see Bering donate £75,000, the proceeds from their ‘Time to Care’ watch to the Polar Bears International Organisation. Following lunch we went to see Thomas Sabo. We signed in and explored the extra long charm bar to catch a peek of the new Spring/Summer releases. We were thrilled with the new additions, the Princess (£49.95) and Frog Prince (£39.95) charms being my personal favourites!! With charms from £19.95 and bracelets from just £21.95 there really is no excuse for not treating a loved one or yourself – I’ve got my favourites on order already! It was then time to enter the exclusive Thomas Sabo cinema and see the ‘Sweet Secret’ reveal. The cinema was decorated with elaborate 1920s furniture and lighting, to build the mood – we even had black and white macaroons at our seats as an extra treat! The collection was gorgeous and a great addition to any Thomas Sabo fan’s jewellery box. We can’t wait for our fabulous customers to see it – for now we are sworn to secrecy until they reveal it in stores later this year, but one thing we can say is – you’ll love it! Later that night we hit the exclusive Thomas Sabo collection launch party, the theme? ‘Black and White Unite the Night!’ of course! When Sunday came we travelled back to the surprisingly milder West Midlands – for a night’s rest before we set off for another trade show the next day! It’s always important for us at fabulous to make sure we have our finger on the fashion pulse – so Laura from the Bath store updates us on what jewellery we should be wearing this season! I recently had the chance to visit the NEC’s Jewellery Show at Spring Fair, which gave me the opportunity to look out for the Next Big Thing in jewellery! There were a few stand out themes I spotted at the show, including the sheer amount of gold jewellery on display. After talking to the various brand managers they informed me that gold is becoming much more popular. Clogau in particular are a Welsh brand which uses elements of Welsh gold in their pieces, interestingly they are also linked to the Royal Family as Kate Middleton’s wedding band incorporates Welsh gold. This theme of royalty and ‘British-ness’ was very apparent during the show due to the upcoming jubilee and Olympics. Sphere of Life, Nomination and Pandora have all made reference to this in their new collections. However, for me the Next Big Thing is jewellery inspired by different eras. Lola Rose for example introduced the use of bright purples, oranges and yellows in their collection which is very reminiscent of the 1960s. Also they had a lovely black cuff which was very art deco inspired! Swarovski also went for the 60s look – their new collection is called Sweet Sixties and includes big statement pieces and bold shapes. During the catwalk show the music was very 60s and the styling featured Mod-type shirts and monochrome. Jersey Pearl was another brand which used the 1920’s as inspiration, celebrating the elegant designs of a decade which saw pearls first come to the masses. If you would like to get a closer look at jewellery through the decades then make sure you come along to the Girls’ Night Out fashion shows in March at either Leamington or Solihull! And here’s some shots from the Catwalk Show we saw…. After visiting The Jewellery Show at Spring Fair and Pure London exhibitions, fabulous gives you a run down of the latest jewellery trends…. All the fashion glossies have focussed on the trend for over sized earrings and necklaces, and you couldn’t miss them at the fairs we visited! Swarovski are definitely leading the way, and we were privileged enough to have a sneaky look at their “show” collection, which featured huge bauble shaped necklaces in summery coral colours. Oversized pearls were also prevalent and are a nod to this confident trend while maintaining a subtle look! Chunky cuffs and belcher link bracelets were part of a lot of desginers’ new collections too. Yellow gold looks set to be headlining this Summer’s jewellery trends. It has been creeping up on us for a while, and its popularity has increased despite the rise in gold prices. In order to keep costs down, designers are using gold plated materials, such as Daisy who use 24carat gold plate. Pieces plated in real gold look much more expensive that gold coloured metals used in fashion jewellery and the colour will really pop against your colourful Summer outfits. Rose gold is also proving to be more and more popular as does mixing gold colours with silver. Designers have taken their inspiration for the new season from retro styling, and lots of pieces seemed to be throwbacks to the 1960s especially. Think optic shapes, bubble faced watches, and primary colours for long pendants and big rings. The geometric designs of the roaring 20s popped up at designers from Lucas Jack to Lola Rose, with simples lines and angular shapes in bright colours. Look out for our Girls’ Night Out fashion shows with the theme ‘Decades’ taking place in March! This was probably the most striking trend, which saw satin finish metals and matte semi-precious stones used to create chic and eye catching pieces. At Azuni beads made from lava rock have been used, which creates a very interesting combination next to the gold nuggets on their popular dainty bracelets. Plus, as part of his latest jewellery collection, Thomas Sabo has introduced a number of charms in a matte black finish, which have a gothic look. Pair these matte styles with Summer brights, as seen on the brand new Tresor Paris bracelets, to help them stand out even more! It’s Men’ s Day today in all of our stores and online!! Men receive 15% off – just in time for Valentine’s Day! What kind of lady are you buying for this Valentine’s? We’ll tell you which pieces will make the perfect gift for her! 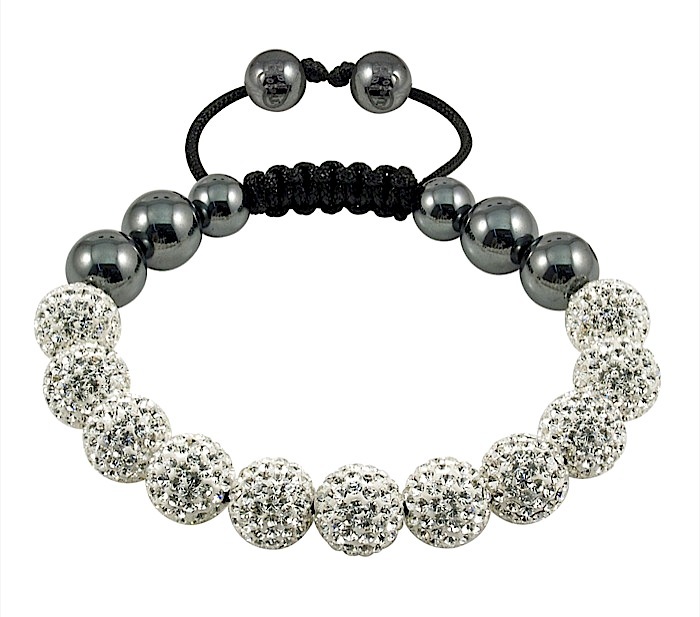 Tresor Paris’ famous glitter ball bracelets continue to be at the top of every fashionista’s wish list. If your lady love always has her finger on the fashion pulse and doesn’t miss a sartorial trick then she will definitely love one of these bracelets. They are available in a huge array of colour combos, but if you want to play on the safe side go for the Laye – a full beaded bracelet with white crystals, truly stunning! ChloBo‘s laidback bohemian inspired jewellery is designed to be stacked up and layered, whether you go for the bracelets, necklaces or rings, and so they exude casual cool. Most of the bracelets come complete with charms, so it’s easy to pick a symbol that will mean something to your special lady or that will remind her of you! 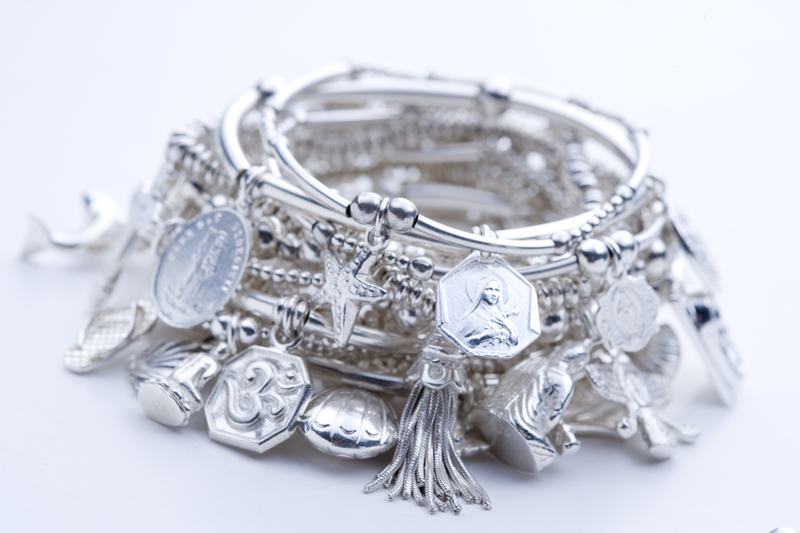 The charm bracelets by Nomination are very different to other types on the high street, and you’ll find that only selected jewellers stock the collection. So if your beloved likes to stand out and wear jewellery she knows not everyone else has – then Nomination is the perfect gift! The bracelets and charms are flat, like a watch strap, so they are very practical and easy to wear, and the range of charms is extensive. 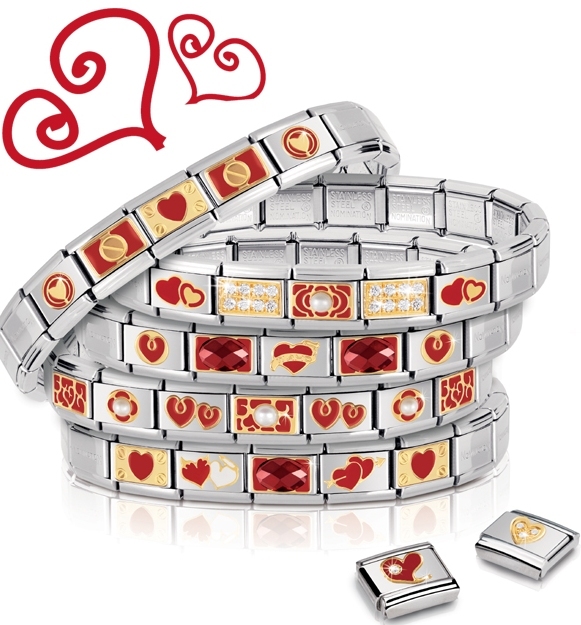 However, for Valentine’s Day you’ve got to choose a charm from their latest Love collection! 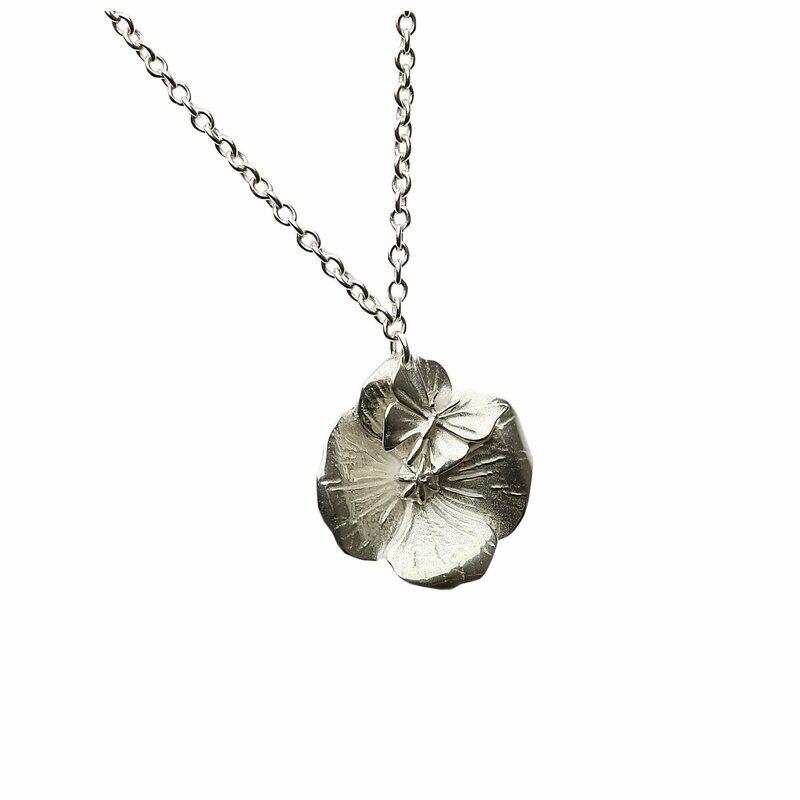 If your lady friend avoids passing trends and likes jewellery that will stand the test of time, head straight for the John Rocha Jewellery collection. His pieces are simple designs in Sterling Silver and are perfect everyday wear because they are substantial and will go with everything! The collection ranges from poppies and bows to abstract patterns, so there’ll definitely be something she’ll love! If yes, then you’d better make sure you pick up the latest Pandora charms, brought out especially for Valentine’s Day! Go for the filigree Sterling Silver hearts charm, which comes in at a very reasonable £20. There are also some fabulous pink heart designs, so make sure you pop in to one of our stores, because we have them all! Have you decided that this Valentine’s Day is time to do something a bit more serious?! 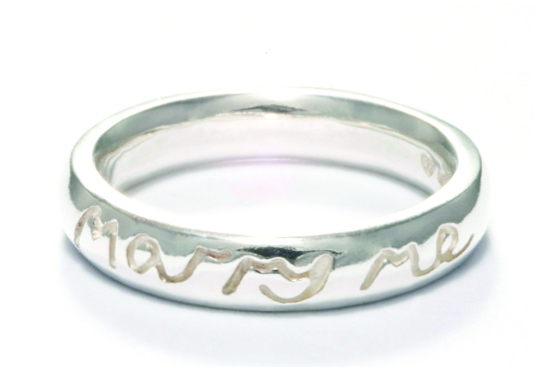 If you want to propose but don’t have the time or knowledge to choose a traditional engagement ring, you need the fabulous Marry Me ring – it’s a plain Sterling Silver band with “Marry Me” engraved on it – so you don’t even have to do the talking! Or if you do have the time to choose a very special engagement ring, take a look at the varied styles in our wedding and engagement ring collection called fabulous forever. We even have a competition running currently for someone to WIN the Perfect Proposal – taking all the stress out of popping the question, so you can enjoy the moment too! Click here to find out more.